When we got out of the car, I put a blanket over Benji to protect him from the cold weather. He was sitting in my neck so I basically had a blanket wrapped around my neck. We went in and while we walked past the counter we waved politely to the owner of the store while continuing our course towards where the java monkeys were located. Benji’s reaction? None whatsoever. I could tell he was a bit nervous but was nevertheless surprised that he didn’t show any interest. The java monkeys on the other end were all plastered against the glass. They all wanted to see who was sitting there in my neck. A few minutes later, the owner came over and decided to get one of her java’s out of their monkey room. She was standing right next to me but once again Benji didn’t show any interest. A few moments later the owner’s husband also joined us which peaked Benji’s interest. He stuck his arm out and Benji didn’t hesitate to get on his arm to sit on his shoulders. It’s odd, in most cases Benji is afraid of strangers but he often shows more affection towards guys than he does towards women. You could tell Benji was all happy since he was making those cute chirping noises but he was still not showing any attention to the java monkeys right next to us. He started licking this guy in his neck, you could tell he found a buddy. We ended up walking through the entire store with Benji, introduced him to the marmosets, the kinkajous, and the lemur. Benji truly couldn’t care less about any one of them although he did look for a second at the funny faces the marmosets were making at him. We bought a few large bird toys for him and ended up going back home. 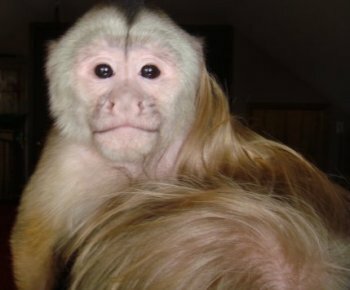 I still wonder … how would he react when he sees another capuchin? Next Entry: What do you feed your monkey? Next Entry What do you feed your monkey?